Hidy Ochiai Karate of Northern Virginia celebrates their grand opening of their new karate school with a ribbon cutting on Friday, October 26th at 3:30pm and an Open House on Saturday, October 27th from 10am-12pm. LEESBURG, Va. - Oct. 19, 2018 - PRLog -- ASHBURN, VA – Hidy Ochiai Karate - Northern Virginia is excited to announce their Grand Opening plans for their new state-of-the-art Karate school in Ashburn Virginia. The school is located in the recently built Ashburn Crossing development just south of One Loudoun by Redskins Park. Their new school is 5,500 square feet and is their flagship location for the Mid-Atlantic region. It is also the 2nd largest training facility solely dedicated to martial arts instruction in all of the Hidy Ochiai Karate schools across the nation. The school includes beautifully designed locker rooms with showers, a vast viewing area, and a 3,000 square foot traditional wood training floor. It is interesting to note that this training floor was made with a special cutting-edge gym floor construction method, creating a surface that is ideal for martial arts classes and instruction. 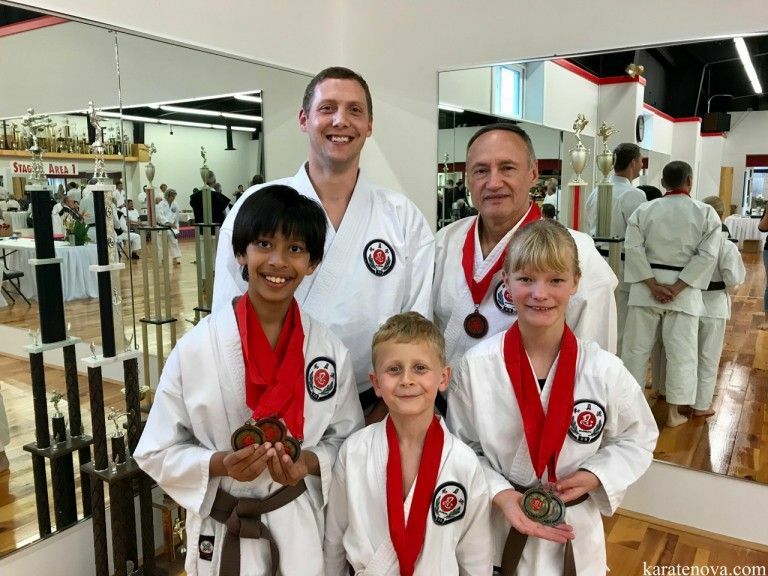 "Sensei William Max Winkler, who owns the Ashburn Dojo states, "I am proud to bring an authentic Japanese Martial Art to Northern Virginia and honored to work and study under Master Ochiai. Our Grand Opening Celebration is a great opportunity to show off our gorgeous new dojo and what we offer through our classes for both children and adults. We welcome all members of the community to come and celebrate with us." World Famous, Master Ochiai will be in attendance both days and his newest book, "The Art and Theory of Self-Defense," will be available for sale and signing on Friday and Saturday. Hidy Ochiai's mastery of the martial arts has been featured on ABC's Wide World of Sports, ESPN and frequently on the covers of top industry magazines, including Black Belt Magazine, Martial Arts Illustrated and Martial Arts Professional. Master Hidy Ochiai brought Wa-shin Ryu Karate-do to this country in 1966. It is based on the principles of Budo (the martial way) – respect, honor, and self-development. For more than 50 years Master Ochiai has taken a holistic approach to martial arts practice that guides students to realize their potential. Hidy Ochiai's highly acclaimed training/teaching model equally emphasizes the development of the mind and the body in a self-paced training program. In 1996, the New York State Education Department validated Ochiai's Educational Karate Program (EKP) as an effective in-school curriculum to teach character education, safety awareness, and violence prevention strategies. EKP directly addresses the problems of bullying and encourages cooperative and respectful learning environments. Here is a link to Master Ochiai's unmatched, jaw-dropping sword demonstration: (http://www.youtube.com/watch?v=G3EZcKsiYRU). It has garnered over a million views on YouTube. Noteworthy from Hidy Ochiai students: On Saturday, September 29, 2018, five students from Hidy Ochiai Karate - Northern Virginia traveled to upstate New York to compete in the 52nd Annual Wa-shin Ryu Karate National Invitational Tournament. There were 150 people in attendance, and their competition team returned home with four gold, two silver, and six bronze medals, with every competitor taking away at least one medal! The Annual Wa-shin Ryu Karate National Invitational began in 1966. It is one of the oldest and longest-running traditional Japanese martial arts competitions in the United States. Historically, this tournament has drawn great legendary martial arts competitors, such as Joe Lewis, Jeff Smith, and Everett "Monster Man" Eddy. If you are interested in learning more about Wa-shin Ryu Karate, visit (http//:www. karatenova.com) and begin your path to becoming a martial artist today. Or, please contact dojo@karatenova.com to get started. If you are interested in interviewing Master Ochiai or Sensei Winkler or need additional information, please contact Elysa Leonard of Splash Communications at 571-426-5145 or email: elysa@splashmarcom.com.